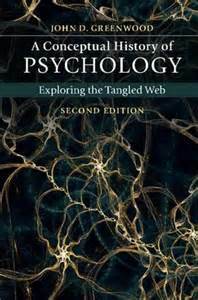 2015: A Conceptual History of Psychology: Exploring the Tangled Web. (2nd Ed.) Cambridge: Cambridge University Press. The largely unfinished task of psychological science to understand the roots and nature of human thinking and behavior in comprehensive fashion argues against an premature closure of on the questions and concerns that this and other volumes examine. 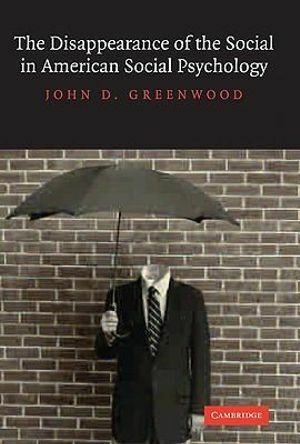 The success of Greenwood’s attempt in this book, I would suggest, lies in how clear and compelling a way he has been able to trace the fundamental conceptual arguments in psychology across the scope of Western culture and, ultimately, demonstrate their continuing relevance to to major concerns raised in 21-st century psychology. His book offers a nuanced and sophisticated response to the lament of my early instructor in behavioral modification and suggests that psychology has, indeed, done more than simply invent the wheel. 2009: A Conceptual History of Psychology. New York: McGraw-Hill. Greenwood’s textbook…succeeds in striking a balance between coverage of psychology’s ideas, its individuals, and the contexts within which it continues to develop. Greenwood employs three strategies to create this balance. First, he demonstrates the continuities and discontinuities that exist between the many ways philosophers and psychologists have come to understand human thought and behavior. For instance, many textbooks simplistically connect Wundt’s psychology with Titchener’s structuralism, but Greenwood teases apart their many agreements and differences, which is a more nuanced and accurate portrayal. A second strategy is making sure students understand the importance of context in the development of a scientific psychology. Greenwood does an admirable job of incorporating these contexts into the text. Of particular note is his coverage of the contexts related to evolution. Greenwood weaves together the many external factors involved in people’s reactions to Darwin’s theory of evolution by natural selection, making it clear to students that there were many issues involved with people’s acceptance or rejection of the theory. Greenwood’s third strategy is not only to employ primary sources and quote them liberally throughout the textbook, but also to take advantage of the scholarship in the history of psychology that has provided a more critical perspective on psychology’s history over the past 40 years. Incorporating this scholarship enriches each chapter and assists in clarifying certain myths that persist in psychology’s history, largely due to unrevised history of psychology textbooks. 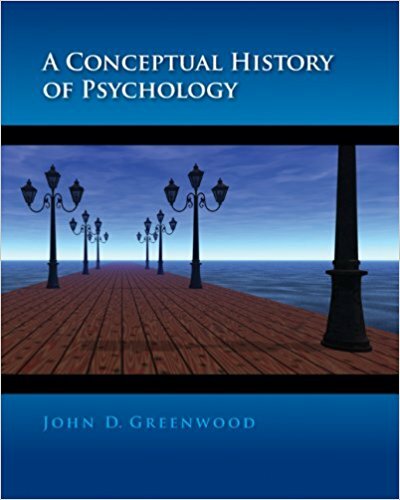 Overall, psychology students and others interested in learning more about the broad strokes of the development of psychology would enjoy and learn much by reading Greenwood’s textbook. 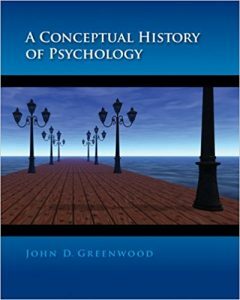 John Greenwood’s textbook, for upper level undergraduates and graduate students, “traces the continuities and discontinuities in our theoretical conceptions of human psychology and behavior from the speculations of the ancient Greeks to the institutionalized scientific psychology of the 20th century.” He finds continuities between Aristotle and modern cognitive psychology while “teasing apart historically associated positions that have no essential connection” like that of materialism and the idea that human and animal psychology are of the same cloth (xix). He doesn’t portray the history as “progressive and integrated” because it isn’t; much depends on contingencies and chance. He spices the text with human interest items about some of the key players, and pits contemporary historical research against some accepted but erroneous teaching, e.g. on witch hunting in the middle ages and treatment of the insane in asylums. Greenwood’s book is exemplary in many ways. A fluent writer and teacher, he is at home in history, philosophy, and the sciences. May the book find a secure place in psychology curricula, and on the short list of required reading for doctoral candidates. For non-specialists it is attractive enough to engage those who are subject only to their own requirements for enlightenment. A Conceptual History of Psychology brings intellectual clarity to the fascinating and complex evolution of the discipline now known as psychology. The best chapters on the development of behaviorism and neobehaviorism that I have ever read. The author has a clear writing style and an eclectic approach to some difficult material. I am going to enjoy using this book. The author does an amazing job of connecting ideas and people over time. As a historian, the author has definitely done his homework and clarified the truth behind the myths in many areas. 2004: The Disappearance of the Social in American Social Psychology. New York: Cambridge University Press. Cambridge Studies in the History of Psychology. John Greenwood’s The Disappearance of the Social in American Social Psychology offers a new and provocative history of a central subfield of the psychological sciences…The book’s conceptual historical approach provides the reader with a compelling and informative recapture of distinct ideas about the social and the individual that circulated through early twentieth century American psychology. John Greenwood has written extensively on the problems that have bedeviled the project of transforming the many informal ways that people have come to understand their social lives into a scientific discipline. In this work he delves more deeply into the foundations of American social psychology to address one aspect of the paradox that is so apparent to outsiders. The ideology of American culture is bound up with the rhetoric of individualism and personal autonomy. Greenwood’s book challenges the deepest aspect of this ideology, the role of individualism in the unexamined foundations of social psychology. This critical conceptual history may be ‘a new animal…for many historians of the social and behavioral sciences.’ Greenwood writes an internalist history from the perspective of a philosopher. He has examined the theoretical literature of social psychology and its antecedents very thoroughly and he writes from a basis of solid scholarship. If one disagrees with him (and given his radical critique, many will), it will seldom be because he misunderstands or misrepresents his sources. Social psychologists cannot afford to ignore his claim that they are no longer interested in the social. The conceptual history of social psychology that Greenwood provides is a substantial contribution that goes beyond the critical histories of Farr (1996) and Collier, Minton and Reynolds (1991). 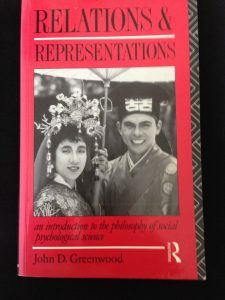 Many features of 20th century social psychology are interestingly illuminated when seen through the lens of Greenwood’s sharply focused study. Greenwood’s book is unequalled in its sustained conceptual analysis of what was lost during the historical development of social psychology. It represents a profound theoretical contribution, sympathetic to empirical work, and offers an insightful commentary on the field’s current problems. This book by an outstanding scholar is a major contribution to understanding social psychology. The author spells out how early 20th century views of the ‘social’ were ignored or discarded, resulting in a contemporary social psychology that is too individualistic. He points the way to bringing the ‘social’ back in. 1994: Realism, Identity and Emotion: Reclaiming Social Psychology. London: Sage. This challenging book…by an unmistakably gifted author…is full of surprising, refreshing ideas…Greenwood shows that the attribution of social dimensions to psychological phenomena is no threat to the objectivity of scientific theories [of identity and emotion]. Whether one agrees with Greenwood’s ideas or not, his approach is thought-provoking. 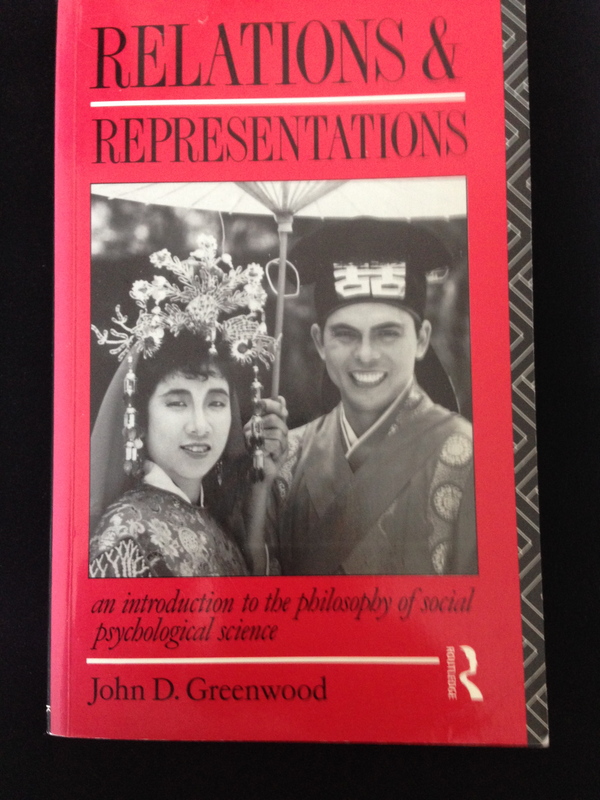 1991: Relations and Representations: An Introduction to the Philosophy of Social Psychological Science. London: Routledge. found in most mainstream and alternative texts…an excellent introduction to an important philosophical challenge to the accepted ways of conducting social psychology. Greenwood’s impressive heir to Harré and Secord’s The Explanation of Social Behavior should become required reading for serious practitioners of the philosophy and science of social psychology…in the course of clarifying what constitutes the subject matter of social psychology, he has both given us powerful rejoinders to the social constructivist critique and deepened our understanding of basic problems in theory and research. Greenwood offers us a view of the crisis in social psychology that is a call to develop our science rather than despair of it. 1997: The Mark of the Social: Discovery or Invention? Lanham, MD: Rowman and Littlefield. 1991: The Future of Folk Psychology: Intentionality and Cognitive Science. Cambridge: Cambridge University Press. 1987: The Idea of Psychology. Singapore & Athens: Singapore & Ohio University Press. 1977: A Selective Bibliography of Philosophy of Science. With R. Harré, J. Hawthorn, and W. Newton Smith. Oxford: Hannon. 2017: Psychologists go to war. Behavioral Scientist, May 22. 2016: Solitary social belief. Synthese.10.1007/s11229-016-1037-9 DOI 2016: All the way up or all the way down? : Some historical reflections on theories of psychological continuity. Journal of Comparative Psychology, 130, 205-214. 2015: Is social psychology truly social? In H. Miller (ed. ), The SAGE Encyclopedia of Theory in Psychology. Thousand Oaks, CA: Sage Publications. 2014: Intelligence defined: James, Wundt, Cattell, Thorndike, and Yerkes. In S. Goldstein, J. A. Naglieri, and D. Princiotta (eds. ), Handbook of Intelligence: Evolutionary Theory, Historical Perspective, and Current Concepts. New York: Springer. 2014: The social in social psychology. Social and Personality Psychology Compass. 8/7, 303-313. 2013: History of philosophical psychology. In B. Kaldis et al (ed. ), Encyclopedia of Philosophy and the Social Sciences. London: Sage. 2013: Social facts. In B. Kaldis et al (ed. ), Encyclopedia of Philosophy and the Social Sciences. London:Sage. 2011: On the social dimensions of moral psychology. Journal for the Theory of Social Behaviour, 4, 331-364. 2010: Bells, whistles and cogs in machines: Thomas Huxley and epiphenomenalism. Journal for the History of the Behavioral Sciences, 46, 276-299. 2009: Materialism, strong continuity and early American psychology. Theory and Psychology, 19, 544-564.
the Human Sciences, 21, 103-126. 2007: Strange bedfellows. Review of Unfolding Social Constructionism by Fiona Hibberd. Theory and Psychology, 17, 605-607. 2007: Unnatural epistemology. Mind and Language, 22, 132-149. . Thought, 1700-1840. Times Literary Supplement. December 22. 2003: Individualism and collectivism in moral and social thought. In K. C. Chong, S. Tan and C. L.
2003: Wundt, Völkerpsychologie, and experimental social psychology. History of Psychology, 6, 70-88.
of the Behavioral Sciences, 36, 443-455. 1999: From Völkerpsychologie to cultural psychology: the once and future discipline? 1998: Psychological ascription. Theory & Psychology, 8, 503-526. 1998: Mindspotting. Review of Theories of Theories of Mind, edited by P. Carruthers and P. K.
Smith (Cambridge University Press, 1996). Philosophical Books, 39, 117-118.
and Erwin. Philosophy of Science, 64, 497-510. Social: Discovery of Invention? Lanham, MD: Rowman and Littlefield. 1996: Freud’s ‘tally’ argument, placebo control treatments, and the evaluation of psychotherapy. Philosophy of Science, 63, 605-621. Sciences of Memory, by Ian Hacking. International Studies in Philosophy. Research, Methods and Theory. Hillsdale, N.J.: Laurence Erlbaum Associates. With P.F. Theory of Social Behaviour, 24, 25-46. 1993: Split brains and singular personhood. Southern Journal of Philosophy, 31, 285-306. 1992: Against eliminative materialism: From folk psychology to Völkerpsychologie. 1992: Self-knowledge: Looking in the wrong direction. Behavior and Philosophy, 12, 110-122. 1992: The social constitution of emotion. New Ideas in Psychology, 10, 1-18.
dimensions of mind and action. Theory and Psychology, 2,131-151. Intentionality and Cognitive Science. Cambridge: Cambridge University Press. (American Psychological Association), 15, 116-125. Duhem thesis. Philosophy of Science, 57, 553-574. 1989: Analycity, indeterminacy and semantic theory. Philosophical Studies, 57, 301-310.
negotiation’ hypothesis. Journal for the Theory of Social Behaviour, 18, 373-389. 1988: Agency, causality and meaning. Journal for the Theory of Social Behaviour, 18, 95-115. Awarded JTSB Theory Prize for 1988. 1987: A realist theory of psychology. In J. D. Greenwood (ed. ), The Idea of Psychology. Singapore & Athens: Singapore and Ohio University Press. 1987: Introduction: philosophies and psychologies. In J. D.Greenwood (ed. ), op.cit. 1987: Emotion and error. Philosophy of the Social Sciences, 17, 487-499.
meaning of human action. Human Studies, 10, 179-204.
explanation and generalization. Journal for the Theory of Social Behaviour, 12, 225-250. Copyright © 2007 John Greenwood • Powered by WordPress • Using Blue Zinfandel 2.0 theme created by Brian Gardner. Packaged by Edublogs - education blogs.